(BPT) – For those who live in snow-belt states, winter driving can be especially challenging. Snow (and related weather events, like frost, sleet and freezing rain) can significantly reduce the friction of the road surface, and slippery roads are significantly more dangerous than dry roads. You are about 50 percent more likely to have a crash on a road under winter driving conditions than on the same road under dry conditions, according to a variety of studies. States, cities and local agencies use many available tools to take care of our roads and address the negative consequences of winter weather. By plowing snow and using road salt in a safe and sustainable manner, road agencies can reduce accidents on roads under winter driving conditions by as much as 88 percent and can reduce injuries in those crashes by 85 percent, according to a study by Marquette University. Those are significant improvements in safety. The key is in recognizing how road salt works. The purpose of the road salt is not to melt the snow, but rather to stop the snow from freezing to the pavement. If that goal is achieved, then plowing the snow off the road is simple and extremely effective, and it turns out that preventing that bond does not take much salt. The exact amount depends on a variety of factors (example – the colder the road surface, the more salt is needed) and will be different for every storm. Getting the road salt to the right place means having plow trucks deployed at the correct time, and in order to keep the road salt on the road surface (rather than bouncing off or being swept into a ditch) agencies pre-wet the road salt with salt brine. In addition to enhancing the safety of our roads in winter conditions, those snow plows are doing a lot to improve mobility. These “snowfighters” reduce weather-caused delays and congestion, allowing for emergency vehicles to respond more quickly when people need help, making for shorter travel times for families, allowing kids and parents to get to school and jobs safely and on time. 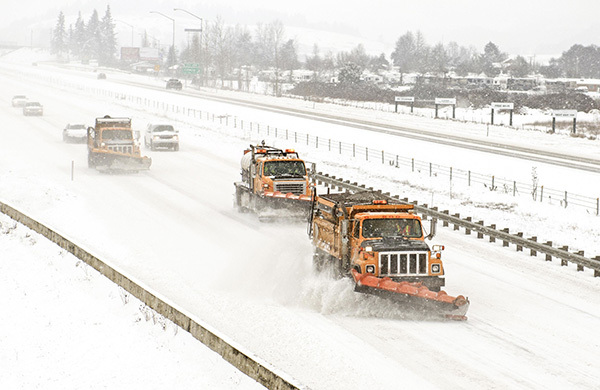 In fact, a study by IHS Global Insight for the American Highway Users Alliance found snow- and ice-related delays and shutdowns hurt hourly workers the most. This study also placed a monetary value on fast and effective snow removal and salting. According to the researchers, a state can incur economic losses of between $300 million and $700 million every day that roads are closed and impassable. Those snow plows are not just helping keep families together and safe, they are helping to keep the lifeblood of our commerce pumping during winter storms. A Crystal Township man died and a passenger was critically injured last Saturday, when the man’s ORV went through a hole in the ice on Crystal Lake. According to the Michigan State Police in Lakeview, the crash occurred on Crystal Lake, in Montcalm County, at approximately 8:00 p.m., February 13. The preliminary investigation found that an ORV being operated by Lee Avery, 52, of Crystal, was traveling across the frozen lake surface of Crystal Lake when control of the ORV was lost and it went into an uncontrolled slide across the ice. The ORV broke through a fenced in portion of the lake, where a Polar Dip event was held earlier in the day, at Crystal Lake’s Winterfest. The ORV then went into the hole that was cut in the ice for that event, submerging the ORV and the four people aboard in the lake. Two of the passengers were able to exit the water, while Avery and the front passenger were still submerged. Bystanders were able to partially pull the ORV from the water utilizing a tow strap and pickup truck. Avery and the other passenger were then attended to by rescue personnel on scene and ultimately taken to Carson City Hospital where Avery was pronounced deceased. The front passenger, a 25-year-old Crystal woman, was then taken to Spectrum Butterworth in Grand Rapids in Critical Condition. The two other passengers had no reported injuries. It is unknown at this time if alcohol consumption is a factor in the incident as the investigation is ongoing. Troopers were assisted on scene by the Montcalm County Sheriff’s Department, Carson City Police Department, Crystal Fire Department, and Montcalm County EMS. 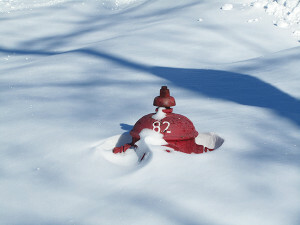 Snow often piles up around fire hydrants, especially after a snowstorm. Post photo by J. Reed. Kids walking to school, customers shopping, firefighters putting out fires, and postal workers delivering mail all have one thing in common—they depend on residents and business owners to make sure ice and snow are cleared away. In the City of Cedar Springs, every occupant of every lot is required to remove the snow and ice from their sidewalks. Area fire departments would also appreciate residents keeping fire hydrants free of snow. Our firefighters often spend several hours shoveling out hydrants after a snowfall, and if an emergency should arise (such as in the case of a house fire), hydrants need to be in clear view. So if you have one near your house, a few extra minutes shoveling might make the difference! You could save a life. Postal workers also need help from residents to keep snow and ice from piling up around their mailbox. Your carrier needs a good clear approach and path on leaving the box. Also, if your mailbox needs to be repaired or replaced, ask your carrier or call the Post Office for the required height. (BPT) Winter is when car trouble can cause big financial problems. So how do you keep your car winter-ready for severe weather and protect your budget? The right preventive care is essential, and the good news is that there are many simple things you can do to get your car ready for extreme weather without blowing your budget. * Avoid the “E.” A full tank of gas provides a comforting feeling. It’s also an effective way to protect your car in severe weather. An empty tank leaves room for the moisture inside to turn to ice. Keep your tank at least half full at all times to help prevent starting issues caused by a frozen fuel line. * Check vital fluids. As simple as filling up, make sure to check and top off your vehicle’s antifreeze and examine your brake system, which includes your brake fluid. * Double-check the tires. Driving on underinflated or worn tires makes it even more difficult to drive in ice or snow. Use a tire gauge to test the tire’s actual pressure and apply air as needed. Your tires should have the appropriate amount of pressure printed on its side. To check the wear of your tires, insert a penny into the tread. If you can see any part of Abraham Lincoln’s head, it’s time to replace the tires. * Be ready to battle ice. Ice on the roads is one problem, but ice on your windshield is another problem entirely. Prestone’s De-Icer Windshield Washer Fluid is designed to help melt ice and frost fast for streak-free and clear visibility down to -27 degrees. * Prep for emergencies. Sometimes even the best planning can’t prevent a severe-weather accident. That’s why it’s good to pack a winter survival kit with an ice scraper, shovel, blankets, extra clothing, bottled water, jumper cables and a first aid kit for the backseat or trunk of your car. And don’t forget the cat litter—in case your tires need a little extra traction. Not all winter car care maintenance needs to be handled in a mechanic’s garage. Easy DIY projects can help ensure your vehicle’s performance this winter and save you time and money in the long run. Get started on your preventive list today and you’ll be ready for whatever the season brings. With warmer temperatures for most of Michigan in the forecast this week, the Department of Natural Resources (DNR) urges ice anglers and snowmobilers to remember: No ice is safe ice. Turner said anglers should be especially cautious in areas where air temperatures have fluctuated. 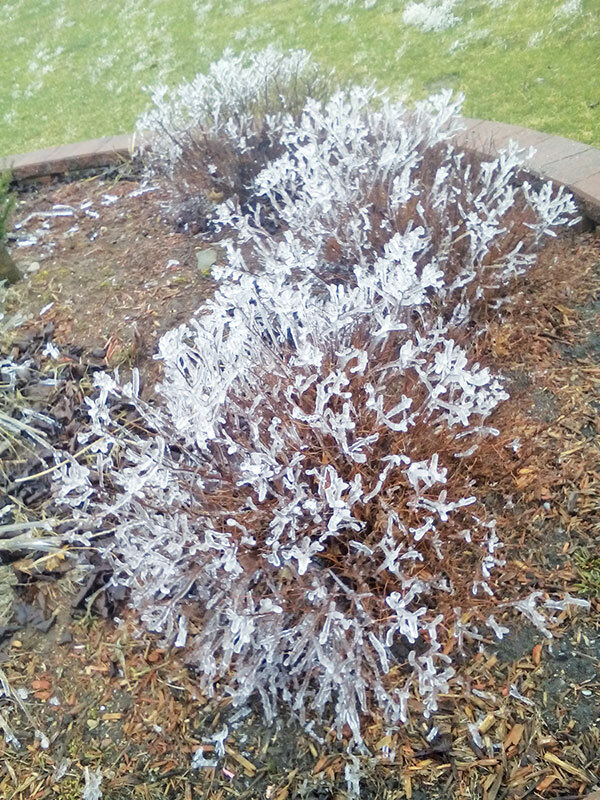 A warm spell may take several days to weaken the ice; however, when temperatures vary widely, causing the ice to thaw during the day and refreeze at night, the result is a weak, “spongy” or honeycombed ice that is unsafe, he said. The DNR does not recommend the standard “inch-thickness” guide used by many anglers and snowmobilers to determine ice safety because ice seldom forms at a uniform rate. Don’t remove your winter clothing. Heavy clothes won’t drag you down, but instead can trap air to provide warmth and flotation. This is especially true with a snowmobile suit. Turn in the water toward the direction you came from – that is probably the strongest ice. Get to shelter, heat, warm dry clothing and warm, non-alcoholic and non-caffeinated drinks. A private snowplow pushes snow into a state highway, causing a public plow to crash and roll over, injuring the driver. Meanwhile, in another area a motorist disregards winter conditions, traveling too fast and crashes into the rear of a Michigan Department of Transportation (MDOT) plow, disabling it. Those are just two cases of hazardous actions in winter resulting in crashes earlier this month in Michigan, and in both cases taking two winter maintenance vehicles out of commission. Two main concerns are when residents and businesses pile snow at the ends of driveways along the highway shoulder, and when snow is pushed across the road, leaving snow or slush on the road surface. 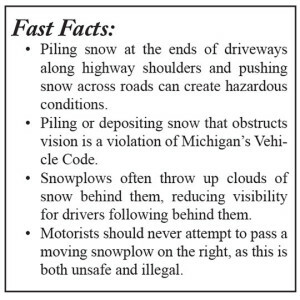 The Michigan Vehicle Code prohibits depositing “snow, ice, or slush on any roadway or highway,” and “the obstruction of safety vision by removal or deposit of snow, ice, or slush.” This includes the end of driveways, where banked snow can reduce visibility for vehicles trying to enter the roadway. Leaving a trail of snow on the pavement while plowing across the road also can create an added hazard to unsuspecting motorists and to road maintenance personnel. Motorists also should be particularly careful around winter maintenance snowplows and salt trucks. These large, powerful vehicles may be traveling at slower speeds than vehicles around them, and may be obscured by blowing snow. “For your safety and the safety of our operators, it’s important to give snowplows a buffer to do their work,” Steudle said. • MDOT snowplows throughout Michigan will be driving at 25 mph when applying salt, which helps keep more salt on the roadway driving lanes where it is most effective. 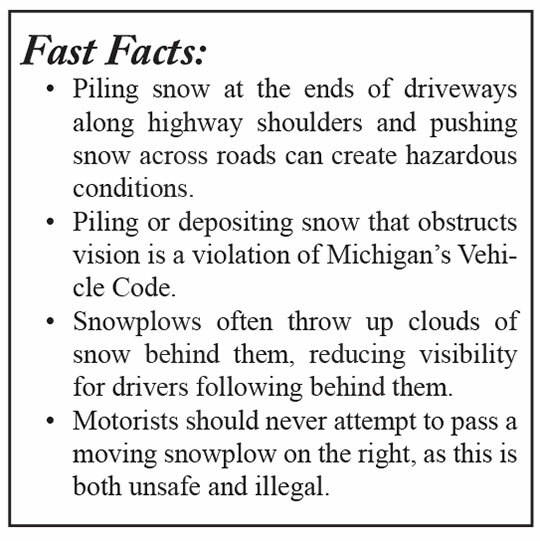 Snowplows may travel at up to 45 mph when plowing only. MDOT says: Drive like you want to make it home tonight. Minor accidents happened all over the area due to slick roads and white outs from blowing snow. This sun dog photo was taken January 7 by Audrey Debri, of Cedar Springs. An early January winter storm over the weekend and bitterly cold temperatures Monday through Wednesday made travel hazardous and caused hundreds of schools and businesses to close in West Michigan. Meteorologists are now predicting that we could get ½ to an 1” of rain on Friday, and with all the snow, it won’t have anywhere to go, and could freeze on Saturday, making travel difficult for Sunday morning. It’s been a cold week. Snow arrived and icy roads have challenged drivers. One driver lost control at Ody Brook and slammed into a large spruce tree. It knocked the tree to a 60-degree angle. This Thanksgiving the driver can be thankful he was not injured. The tree probably will not survive. Meanwhile ice has formed on the ponds and protects the water world of nature niche life underneath. Have you wondered why lakes don’t freeze from the bottom up? If they did, fish would be killed because lakes would freeze solid. 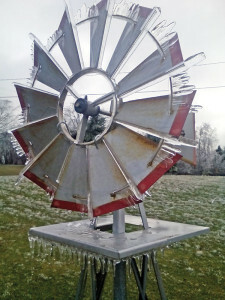 Instead they freeze at the top and form an insolating layer that provides safe haven of aquatic wildlife for the winter. Beavers construct a lodge they enter and exit from under the ice. Branches stored on the lake bottom are brought indoors for bark dinners. The top of beaver lodges rise above the ice allowing air exchange for breathing. A cozy lodge is insolated from extreme winter temperatures. When fall arrives, air temperature cools and heats more rapidly than water. When cold air-cools surface water, the water sinks at 39-degrees F. At that temperature, water becomes its most compact and heaviest. It also holds the most oxygen possible at 39-degrees F. Because it is most dense, it sinks carrying oxygen to the depths of the lake. During summer when sun warms water, a layer called a thermocline forms separating the upper and lower lake. The layer prevents easy movement between the lower (hypolimnion) and upper (epilimnion) lake water. Most plant life is above the thermocline, where sunlight reaches allowing photosynthesis to add oxygen to water during the day. At night, plants need oxygen and consume it for their needs. If algae and other plants are too abundant, they consume the oxygen and suffocate fish. This is known as summer kill. Below the hypolimnion oxygen is slowly depleted because it is not replenished by photosynthesis or water mixing. Plants are few in the dark water, so they do not consume all the oxygen. Fish will often hang out at the thermocline, where they can cool down and slow metabolism so they require less oxygen and require less food. In fall, the cold dense water holding oxygen sinks to the bottom of the lake oxygenating the entire lake. The movement stirs bottom sediments. I have seen Chrishaven Lake at the Christensen Nature Center look like someone stirred the lake with a giant stick in fall. The lake becomes filled with nutrient rich sediments. The activity destroys the thermocline and the lake becomes one even temperature body until the following summer when a new thermocline forms. As water-cools below 39-degrees F, it begins to expand and does not sink. At 32-degrees F, the cold water freezes at the surface forming an insolating blanket. If windy, the blanket will not form smoothly. One can see if air was active or still by how smooth the ice layer is at the surface. Sun can penetrate ice allowing algae photosynthesis to continue. This plant growth will add oxygen to the water during the winter. Sometimes when the snow layer on lakes is thin, light enters allowing algae to become abundant. When too abundant, the algae might consume all the oxygen during the long winter nights causing what anglers know as winter kill. At ice out in spring, dead fish float at the surface from winter suffocation. If the lake has streams flowing in, oxygen might be replenished. Fish will be found at these oxygen rich areas of the lake. A heavy snow blanket can prevent too much winter sun from entering the lake. It is the time of year when people are thinking of getting on the ice. Polar bears hunt seals from the ice. We hunt fish or maybe just enjoy a walk on open ice of meandering streams or on lakes. When I lived along the headwaters of the Mississippi River in the section that is classified as “Wild and Scenic,” the river froze thick in winter. We experienced below zero temperatures from about Christmas to mid February. Day temperatures were up to about zero and night temps were -20 F or -30 F except on cold nights when it dropped to -40 F.
I waited for solid ice before venturing out. Unfortunately, some are too anxious. A young father and vice-president of a local bank traveled by snow machine on a lake and never returned. It amazed me that when I would leave Minnesota for a Michigan Thanksgiving, Lake Bemidji was mostly open water. Four days later when I returned, people were driving pickup trucks on the ice to open water. Brave or foolhardy? Where I lived, I hiked through knee to thigh deep snow to the wild section of the Mississippi. It was a peaceful joy to reach the river. The ice was bare and windswept. Walking was easy. Where shallow snow was present, I could follow fox tracks. The fox knew the easy travel routes. I lived along the first 35 miles of the river between Lake Itasca (the headwaters) and Bemidji. After Lake Bemidji, the river no longer qualified for the Wild and Scenic status. It does remain scenic and many areas still have wild character. The woods were quiet in winter but red squirrels sometimes chattered at me, common ravens croaked over the forest. Black-capped chickadee, evening grosbeaks, purple finches, common redpolls among others kept me entertained at home feeders. The river was quieter except for occasional conversations it initiated. The ice was friendly and talked to me. I wondered if it was sending mixed messages but it was not. I would hear loud cracks and snaps. I could peer down 2 to 3 feet into some cracks. The river said it was safe for walking. For that matter it would be safe driving but that section of the river was not accessible to motor vehicles. Not even snow machines accessed the area. That pleased my senses of sight, hearing, and smell. Wild places are best enjoyed when we allow nature to make the sounds, sights, smells, touch textures, and taste. Wild places for nature niches are wonderful for supporting wildlife and for our visits and experiences. 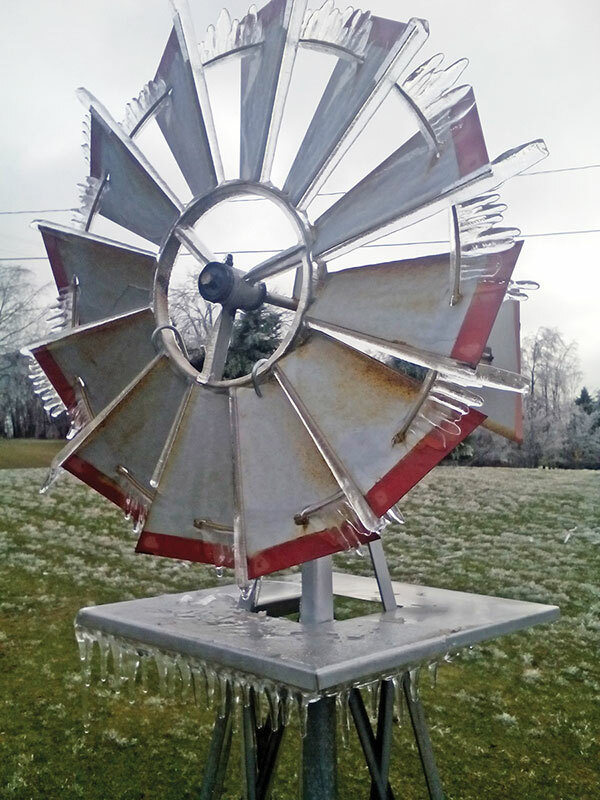 In the southern Michigan climate, ice is more treacherous than where it got cold. 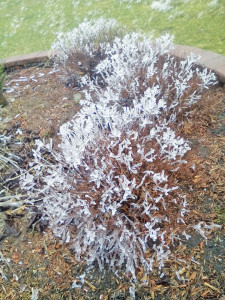 Respect nature’s whims for freezing and thawing. Learn to live with nature. The alternative is to die by natural events. Enjoy the coming long or short winter. One last story. I wondered if the fox I was following was male or female. She eventually told me. She squatted to urinate between her tracks. A male would have lifted a leg to grasses along the riverbank. Read the landscape like a good book and behave appropriately for your safety and the health of wildlife that make it home.